Tucked away in the hills of Fiesole on the outskirts of Tuscany’s capital, Florence, Belmond Villa San Michele invites guests to discover what happens when the enticing spirit of modern luxury meets the inspiring soul of the Renaissance. This five star boutique hotel is steeped in history, as a former 15th Century monastery which attributes its gorgeous façade to Michelangelo. While restored with absolute attention to detail, the Villa’s lush gardens, lemon grove surroundings and panoramic views of the city skyline, still capture the old-world charm of Italy. Take the 15 minute shuttle service into Florence and spend the day exploring its treasures before returning to the hotel terrace for exceptional local cuisine. 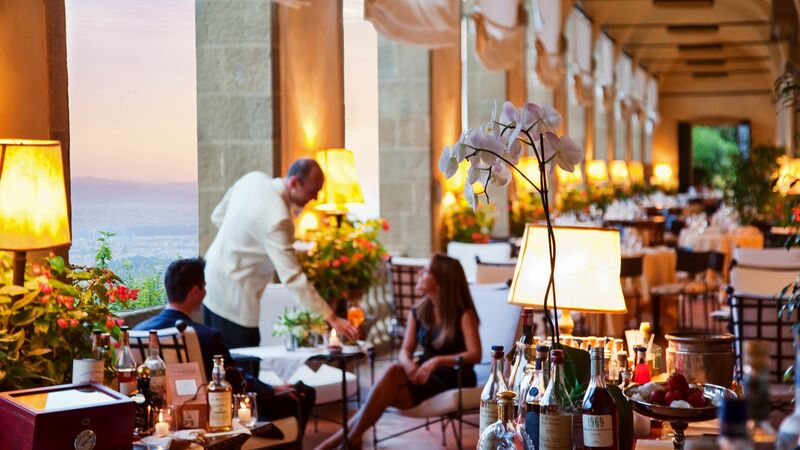 This hilltop setting, combined with attentive service, is an ideal choice for celebrating special occasions in true Florentine fashion. Information: Hotel child prices apply to ages 2–11 years. Make your way to the hilltop swimming pool for morning coffee or a lazy lunch of wood-fired pizzas, all in the company of exquisite Italian gardens and panoramic views. Open: 12:30 - 16:00 and 19:30 - 21:30 Saturday - Monday from June to September. Drinks are served by the pool and on the terrace where shaded areas and sun loungers are available. 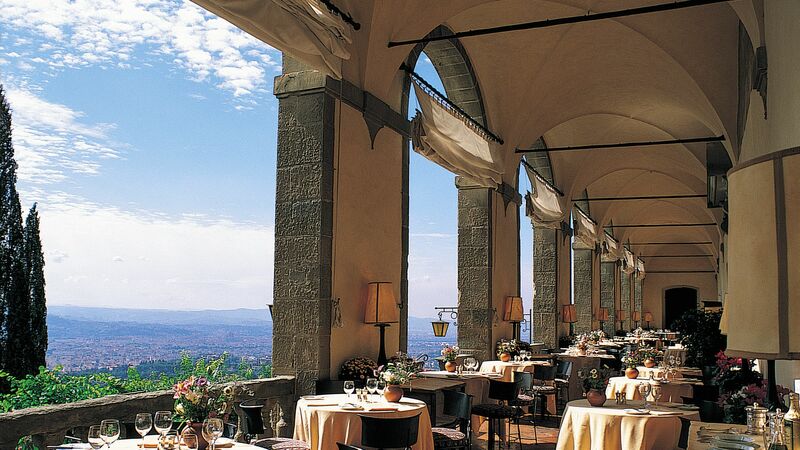 Inspired by the freshest seasonal ingredients, the best of Tuscan cuisine is further refined at La Loggia with its terrace’s elegant monastery arches that showcase Florence's breathtaking surroundings. Open: 07:30 - 10:30, 13:00 - 14:30 and 19:30 - 22:30. The dress code is smart casual, with shoes and long trousers required for gentlemen in the evenings. Breakfast is a full American breakfast consisting of a buffet and à la carte menu. A children’s menu is also available. Indulge in hot and cold drinks and snacks at the Cloister Bar before taking a stroll to the Garden Bar for al fresco sundowners. Live piano music plays from 7pm. When it comes to relaxation, few things compare to the bliss of enjoying refreshing cocktails and succulent snacks by a hilltop pool that offers spectacular views from its garden terrace. The Belmond Villa San Michele’s heated, open air swimming pool is situated on a grassy plateau above the gardens as an invitation to bask in the serenity of the surrounding Arno Valley and city of Florence. From cooking classes and picnics to Welcome amenities that include toys and T-shirts, the hotel’s experienced staff ensure younger guests feel at home with endless entertainment and a delicious children's menu. Professional babysitting and laundry services, as well as painting classes and circus school, can be arranged at an additional charge. If you need workout motivation, the hotel’s well-equipped gym should do the trick. Open-air pilates and yoga classes are also available and are held in the garden amidst fragrant lemon trees and rose bushes. If you want to develop your own fitness plan, personal training sessions may be arranged. While the enchanting views of Florence are sure to ease you into a state of ultimate relaxation, enjoy Swedish or couple’s massages in an open-air gazebo filled with natural fragrance. 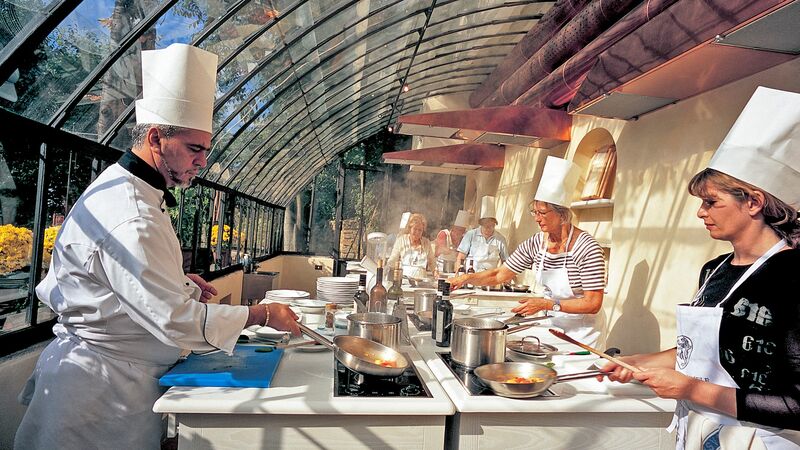 The Belmond Villa San Michele’s world-renowned Cookery School invites adults and children to an exciting, hands-on exploration of freshly prepared Italian cuisine during themed classes, which are hosted by Executive Chef Attilio di Fabrizio. Restrictions: The Young Chefs Academy is available on request from June to August for children aged 6-14 years. The Cookery School is closed in August. Bookings are essential. The Fiesole hills and Chianti region are ideal for guests who seek to immerse themselves in the natural beauty that surrounds Florence. Take some of the area’s most scenic trails with guided tours. Take an adventure that honours the quiet nature of Tuscany, and pedal along the various scenic bike routes between Fiesole and Florence with a personal guide. As you learn more about regional wine making, the tastes of the hotel’s Tuscan wines will take your palate on a journey. The intimate cellar is also ideal for romantic dinners. Set your inner artist free with inspiration drawn directly from nature. This eco-friendly workshop with artist Roberto Ghezzi challenges you to be creative with paper, a brush and natural elements. If Florence is the heartbeat of Tuscany, the surrounding hills of Fiesole are its lungs. A breath of fresh countryside air, this Renaissance town is a 15 minute drive from the bustling city, and offers hilltop accommodation perfect for honeymoon retreats and family getaways. Your experience of the region’s naturally intimate atmosphere is complemented by romantic boat trips along the Arno River with the famous Ponte Vecchio, and the mysterious ancient Roman amphitheatre. The Bardini Museum, Chianti Sculpture Park and Golf Club Ugolino are also worth a visit. For thrill-seekers, hot air balloon and helicopter rides may be arranged. And you will also find Florence’s only wisteria to bloom twice a year at Belmond Villa San Michele – it’s 400 years old. Belmond Villa San Michele is 20 minutes from Florence Airport. Double Classic Rooms have been restored to retain the original touches, featuring views over the cloister or cypress trees. Double Rooms for Single Use are available. Double Superior Rooms are located in the main part of the building and measure 24m² with views of the countryside or courtyard. They have either a king-size bed or twin beds and include air conditioning, satellite TV, Wi-Fi, telephone, minibar, safe, hairdryer, bathrobe and slippers, and luxury toiletries. Junior Suites Deluxe measure 35m² and fantastic views of the old monastery building and the Italian gardens, and feature a furnished terrace area. Rooms have a king-size bed or twin beds, air conditioning, satellite TV, Wi-Fi, telephone, minibar, safe, hairdryer, bathrobe and slippers, and luxury toiletries. Junior Suites Superior measure 35m² and feature a furnished terrace leading to the gardens. They have either a king-size bed or twin beds and include air conditioning, satellite TV, Wi-Fi, telephone, minibar, safe, hairdryer, bathrobe and slippers, and luxury toiletries. Junior Suites Executive measure 35m² and have beautiful views of Florence or the Italian gardens and feature a furnished terrace area. These rooms benefit from large bathrooms with a walk-in shower and bathtub. Other facilities include a king-size bed or twin beds, air conditioning, satellite TV, Wi-Fi, telephone, minibar, safe, hairdryer, bathrobe and slippers, and luxury toiletries. Suites Florence View (Donatello and Michelangelo) are located within the main building of the hotel, measure 60m² and have a bedroom area with a king-size bed or twin beds plus a separate lounge area. Rooms benefit from air conditioning, satellite TV, Wi-Fi, telephone, minibar, safe, hairdryer, bathtub, separate shower, bathrobe and slippers, and luxury toiletries. Garden Suites Florence View measure 60m², are located within the gardens with a beautiful terraces overlooking Florence. The rooms benefit from a separate spacious living area plus a bedroom with a king-size bed or twin beds. Facilities include air conditioning, satellite TV, Wi-Fi, telephone, minibar, safe, hairdryer, bathtub, separate shower, bathrobe and slippers, and luxury toiletries. Stay for a minimum of 3 nights and receive one night free when staying in any Double Room or Junior Suite for holidays between 01 April - 31 May 2019, 04 August - 05 September 2019 and 29 September - 02 November 2019. Save up to 15% on the hotel price for holidays booked at least 45 days in advance staying between 01 April - 31 May 2019, 04 August - 05 September 2019 and 29 September - 02 November 2019. Please note offers cannot be combined. The only way to describe the experience this hotel offers is pure fairytale. From the check in experience, we were treated like royalty. The concierge and the wonderful people at the reservations desk go above and beyond to make sure your stay is magical. The property itself is straight from a hollywood movie. We stayed in the deluxe king room and it is superb, the bathroom is fit for a king, the bed is so comfortable and the views will keep you staring out the window all day! There is a free shuttle the runs every hour to the center of florence until about 8pm. Any taxi trip will run you around 30euros. If you plan accordingly you don?? ?t need to spend a dime on transportation. Breakfast is included in the room stay and is delicious and plentiful. I cannot wait to return! One of the best hotels in the Florence area. 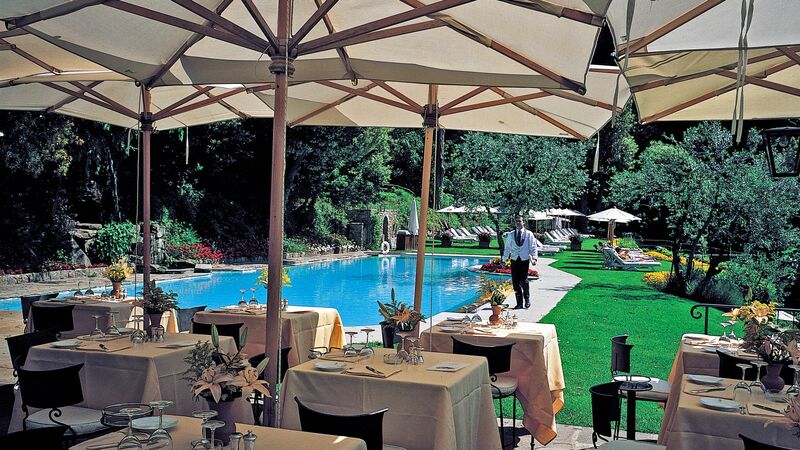 Secluded from the hustle and bustle of Florence, overlooking the city, tremendous grounds and service. Highly recommend. Shuttle was a great easy way to get into the city and then escape the chaos when you want to retreat from it all. Amazing views of Florence. Beautiful luxury hotel. Amazing food. Very good staff. Free shuttle ride to city center. Garden rooms have the best views. Good sized rooms. Often when low occupancy you get an upgrade. “ Out of the fray in cool hills above Florence! We are huge Belmond fans, so always glad to try one of their properties. 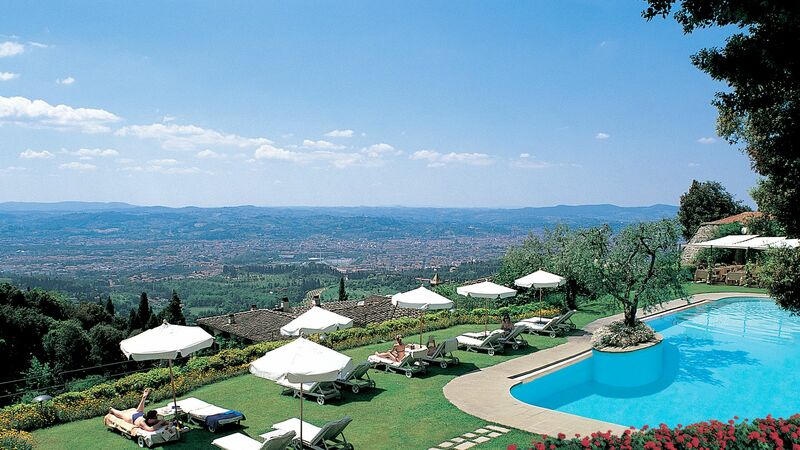 This hotel sits high in the hills above Florence. A regular hotel shuttle runs you in and out of town. Perfect arrangement for taking in all the city while getting out of the fray at the end of the day. We were upgraded to a small suite. Lovely room and amenities. Pool with a city view. Gorgeous view all over the grounds. Many steps, so be ready. Restaurant buffet for breakfast as part of the room rate. Ate one night for dinner. Was fine but not stellar. But why eat at hotel when the food in Florence awaits?! Rooms are pricey. We would book again for a night or two, but hard to say what the property and staff delivered was worth the high cost. I would give it 3.5 rating if allowed. The hotel was extremely clean and the staff provided exceptional service. What you see in pictures are exactly what you see when you?? ?re here. The views from the hotel are like out of a magazine. The staff will go out of their way to offer suggestions and make arrangements for places to eat based on what you want to experience. Can?? ?t say enough how amazing this hotel was.